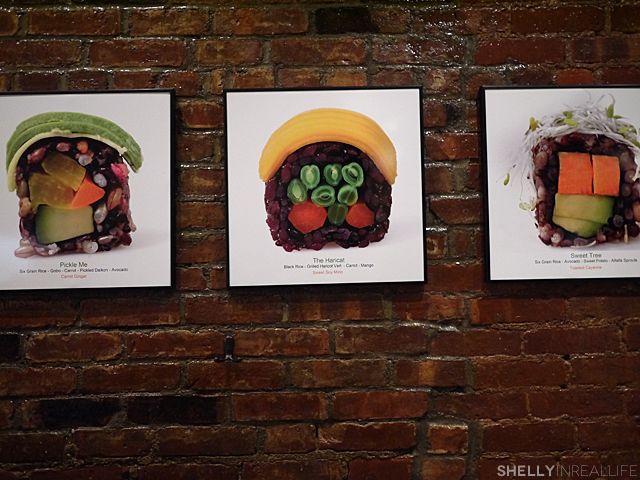 Looking for healthy food that's not only affordable but delicious? 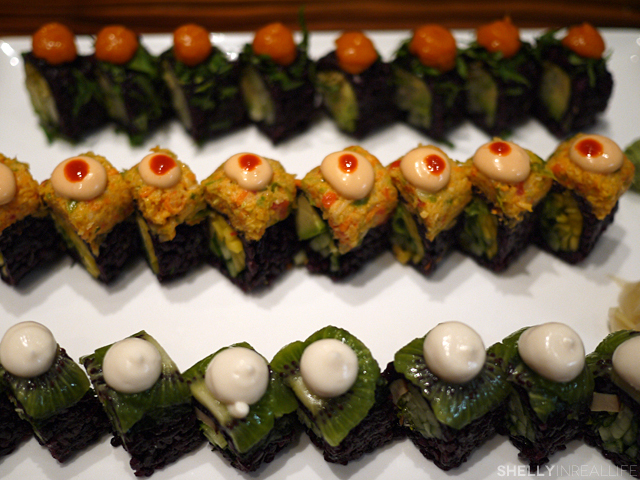 Look no more, Beyond Sushi serves just that, 100% vegan sushi, unlike anything you've seen before. I've seen Beyond Sushi and its 4.5 star rating on Yelp in the past. But, given the choice between eating regular sushi versus the vegan sushi at Beyond Sushi, I usually choose the sushi that I know and love. I mean, sure it looked pretty, but vegan sushi? Really? 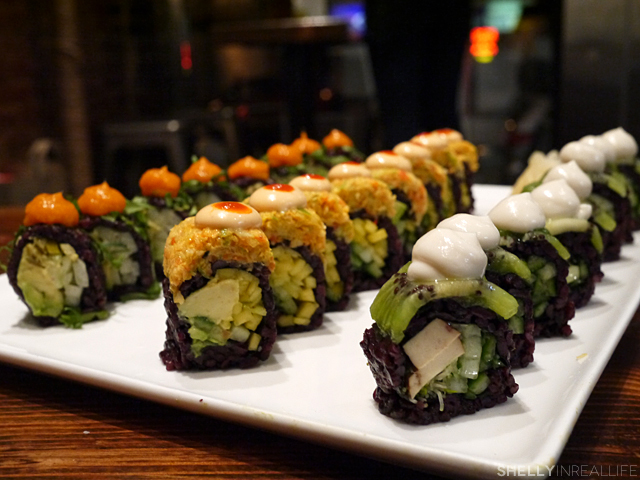 The words vegan and sushi just doesn't seem to go together. This all changed when I was doing my cleanse, and became desperate for a taste of sushi. Since I couldn't eat raw fish at the time, sushi options were extremely limited so Beyond Sushi was my only option to get my fix. 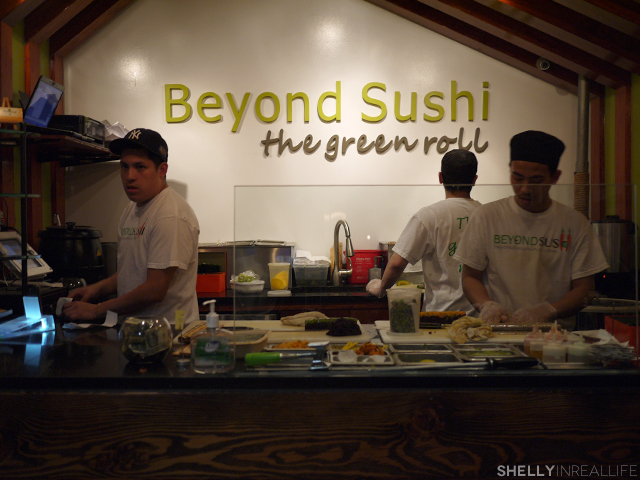 Beyond Sushi is located near Union Square and is opened by Chef Guy Vaknin, a finalist on Hell's Kitchen. He was inspired to promote a healthier lifestyle so he opened a concept that is clearly missing in the current market. Vegetarian sushi is usually pretty boring, usually an afterthought make from ingredients that are left over from the regular rolls. 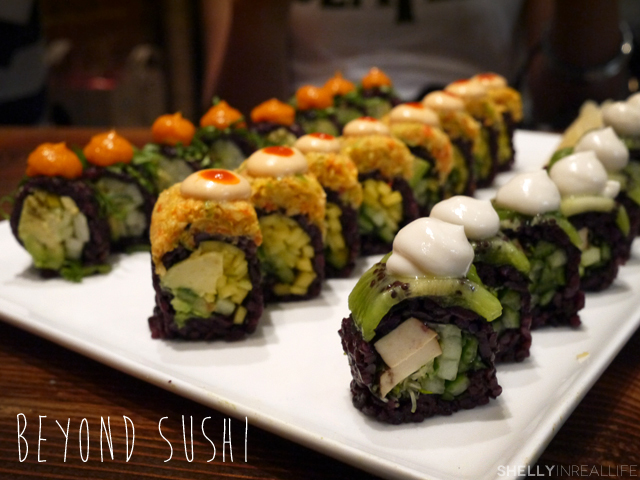 However, the menu at Beyond Sushi gets really creative and each roll is not only bright and colorful since it's only made from plant-based ingredients but there is pretty much no guilt after eating because everything tastes so fresh and healthy. Another thing that I love about the rolls at Beyond Sushi is that it's each topped with a sauce that enhances the rolls. I especially like their toasted cayenne sauce, which reminds me of spicy mayo, but it's also vegan and gluten free so anyone can enjoy. I seriously love how unique each roll is, and if that's not impressive enough, each of these rolls come at only 6.50 a pop. Seriously, that's cheaper than most rolls at a Japanese restaurant. Another point to Beyond Sushi. Warning: Beyond Sushi is actually a really tiny sushi joint, it only had 3 tables with 4 seats to it each. So don't expect to bring a big party here, if you want to share with many, be sure to just get it to go. To test out how much of my love for this place was my cleanse delusions or if this place was pretty solid, I recently brought my friend Jo here for dinner to see her thoughts. We ordered 2 rolls and Combo #3, which includes a roll and small wrap. We ordered La Fiesta, Spicy Mang, and the Crunch N' Munch (pictured below from left to right). My favorite is definitely the Spicy Mang because I love the spicy vegetable topping along with my fave toasted cayenne sauce. 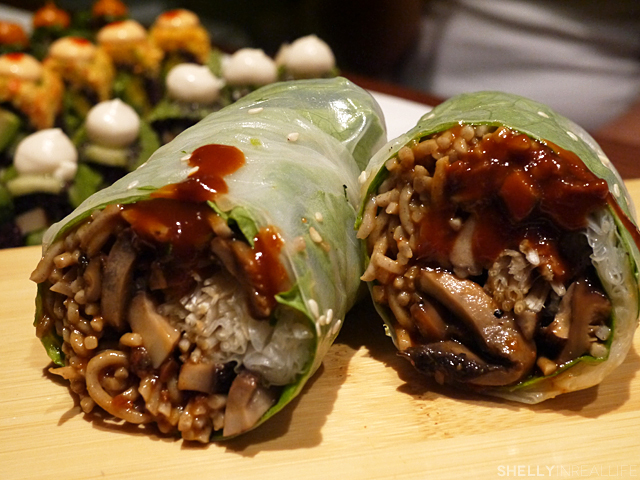 The roll we ended up getting was the Spicy Shroom Wrap made with buckwheat noodles, enoki mushrooms, teriyaki braised shiitake mushrooms, grilled portabella mushroom, pickled ginger, spicy cashews, romaine lettuce and sriracha. Served with shiitake teriyaki sauce. Our consensus at the end is that the rolls start to taste a bit similar, but still delicious none the less. And for less than $25 total, we were able to get a quality and healthy dinner that really filled us up. Jo approved! The only thing negative thing I have to say about Beyond Sushi is that they don't deliver to me - I miss it only by 5 blocks. 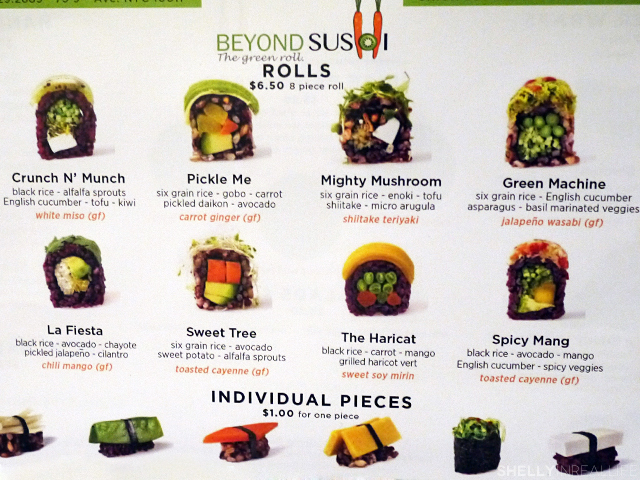 So for you skeptics out there, definitely give Beyond Sushi a try. It won't hurt you to eat a little healthier once in a while.